Verse 10 above tells us that Daniel went to his upper room and prayed as was his usual daily custom. In fact he prayed three times a day. Daniel did not shut his window and so conceal himself, but rather kept it open, as he usually did. He would no doubt have known that he was acting contrary to the king’s decree, but he operated according to a higher order: the command of God. At prayer times, when the Jews were in distant countries, they turned their faces towards Jerusalem; and when in Jerusalem, they turned their faces towards the temple. In 1 Kings chp 8, when king Solomon dedicated the temple, he entreated God to hear the prayers of those who might be in strange lands, or in captivity, when they should turn their faces towards their own land and towards the city which he had chosen, and the house which was dedicated to his name (see 1 Kings 8:48-51 below, part of Solomon’s dedication prayer). It was in reference to this prayer of Solomon that Daniel turned his face towards Jerusalem when he prayed. 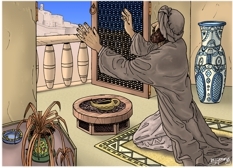 Outside Daniel’s window we can see a small section of the great city of Babylon. 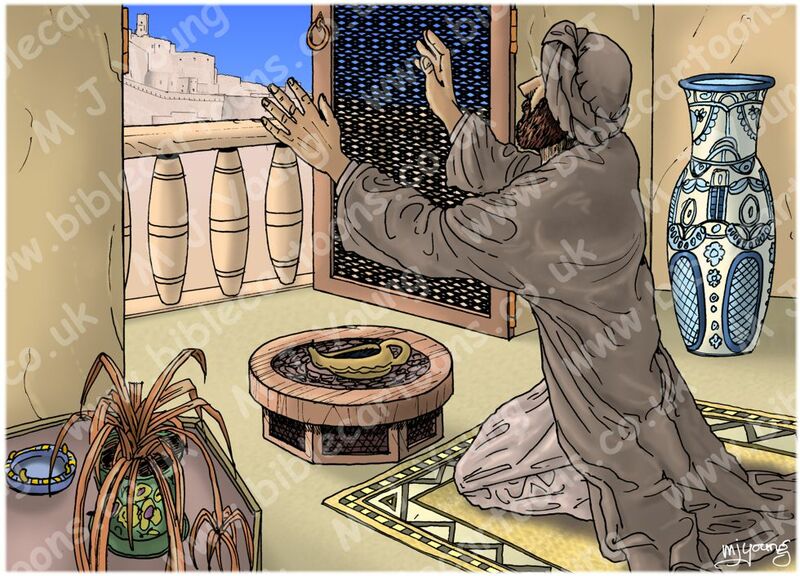 I wanted to make the interior scene seem a bit homely, with a rug, an unlit oil on the table, plants, an expensive looking urn, etc, since we know that Daniel was highly favoured by the king’s of Babylon. 46 “When they sin against you—for there is no-one who does not sin—and you become angry with them and give them over to the enemy, who takes them captive to his own land, far away or near; 47 and if they have a change of heart in the land where they are held captive, and repent and plead with you in the land of their conquerors and say, ‘We have sinned, we have done wrong, we have acted wickedly’; 48 and if they turn back to you with all their heart and soul in the land of their enemies who took them captive, and pray to you towards the land you gave their fathers, towards the city you have chosen and the temple I have built for your Name; 49 then from heaven, your dwelling-place, hear their prayer and their plea, and uphold their cause. 50 And forgive your people, who have sinned against you; forgive all the offences they have committed against you, and cause their conquerors to show them mercy; 51 for they are your people and your inheritance, whom you brought out of Egypt, out of that iron-smelting furnace.